A single rail serving as a track for passenger or freight vehicles. In most cases rail is elevated, but monorails can also run at grade, below grade or in subway tunnels. Vehicles are either suspended from or straddle a narrow guideway. 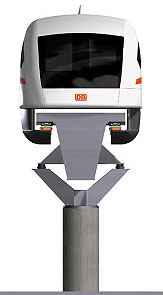 Monorail vehicles are WIDER than the guideway that supports them. The Yamanashi maglev test track is certainly not a narrow monorail-like guideway.